iPhoto 09 is deceptively adept at image editing. Yes, it looks simple, but the essential tools are there for both Raw and Jpeg adjustments. Some of the best goodies, however, are tucked away out of site. In my recent Macworld article, Six essential iPhoto editing tricks, I show you some of my favorite iPhoto maneuvers. A few are simple, such as holding down the Shift key to view "before and after" versions of an adjusted picture. Others are less obvious, such as seeing the readouts for the Enhance tool, as shown below. 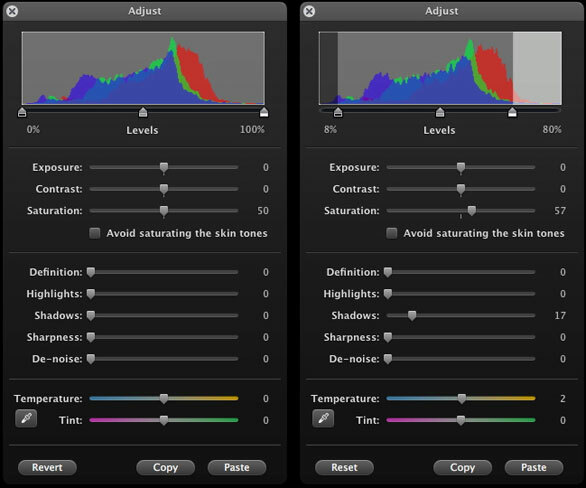 Before and after views of the Adjust panel when the Enhance Tool has been applied to an image. And there's more. So if you want to improve your iPhoto 09 image editing chops, take a look at Six essential iPhoto editing tricks. THANK you! I know a lot more about iPhoto now.